TMJ disorders are common with more than 44 million patients suffering from jaw pain in the US alone. 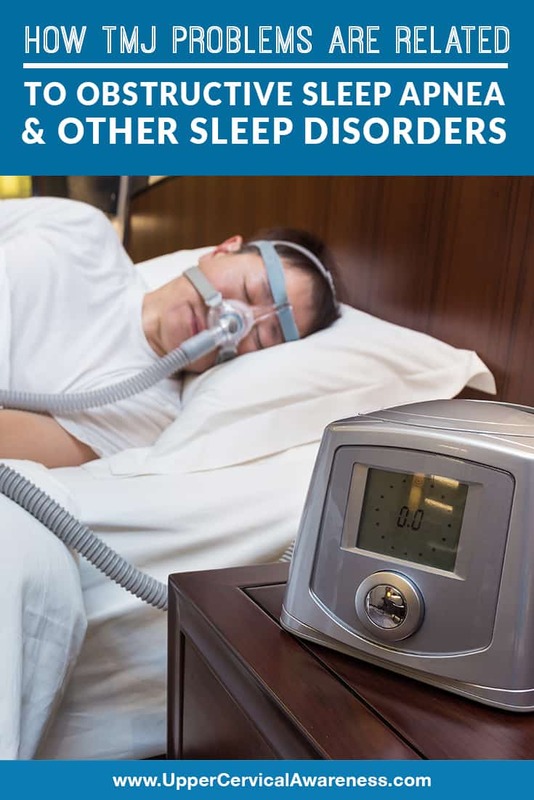 However, what you may not know is that sleep disorders are nearly as common (40 million Americans have some form of sleep disorder), and many people suffer from both problems simultaneously. Why do these conditions commonly occur together? Is there some sort of link between the cause of TMJ dysfunction and conditions like OSA? We are going to address the relationship between these problems and how a natural therapy may be able to help you overcome both. When the TMJ is hurting, the alignment may be off. Such misalignments can also lead to OSA. Obstructive sleep apnea occurs when a person’s airway gets blocking during sleep. As a result, you wake up to get the body breathing again. It may happen over and over throughout the night, but never enough for you to remember actually waking up. Therefore, you just get up in the morning without feeling refreshed. It is usually a person’s partner who hears the obstructions occurring at night, and this can lead to a diagnosis and treatment. Having OSA long-term becomes dangerous and increases the risk of certain heart conditions. This is a case where jaw pain can actually be caused by the sleep problem. Bruxism refers to the grinding of one’s teeth, which often occurs when a person is sleeping. Most cases of bruxism go back to stress and can eventually be controlled. In the meantime, you may need a mouthguard to stop you from being able to grind your teeth at night. This, in turn, may also help relieve jaw pain, assuming the apparatus fits properly. Otherwise, the mouthguard may actually make jaw pain worse. Headaches or migraines also frequently accompany jaw pain, and when these conditions are combined, it can make it particularly difficult to get a good night of sleep. If you suffer from TMJ dysfunction, you may have also noticed that pain frequently radiates toward the ears or the neck. You may also notice that you have a forward head position. If this is the case, it is likely that your head and jaw pain are related to the neck. Ice – Pain is often due to inflammation and ice helps to reduce swelling and pain. Heat, on the other hand, draws more blood to the area and can actually increase inflammation. It is, however, important for healing. So once the swelling goes down, heat may help. Limit jaw movement – Less severe cases of TMJ dysfunction can be relieved by giving the jaw time to rest. Try changing your diet to feature softer foods for a few days so your jaw does not have to work as hard. You can also avoid activities that require opening the jaw widely such as singing. Correct your posture – A forward head position can affect the neck, jaw, headaches, and sleep. Even just having your head an inch forward from its natural position increases the stress on the neck exponentially, so using proper posture is vital. If you work at a desk, make sure all of your screens are at eye level, as screens that are too low will contribute to a forward head position. Stress coping – From neck pain to headaches to bruxism, stress is related to TMJ problems and many of the other conditions mentioned in our discussion today. As a result, it is important to learn to control stress in your life if you are dealing with chronic TMJ pain. One note of caution is that things like smoking (a common way people cope with stress) are actually bad for your neck and jaw. So it is vital to find positive stress coping mechanisms like a new hobby, a hot bath, a massage, or a vacation. If you are suffering from TMJ issues long-term and self-care is only helping take the edge off, then it may be time to give upper cervical chiropractic care a try. It might be able to help you avoid things like long-term anti-inflammatory use. How does adjusting the top bone in the neck help the jaw and affect things like headaches? The atlas is located at the top of the spine which puts it nearby the jaw joint, ears, and facial nerve. As a result, the changes that take place in the surrounding structures when an atlas subluxation exists can cause everything from jaw pain to headaches. Without correcting this underlying issue, it can be difficult to get long-term relief from any of the conditions that it is resulting in. Our website can help you to locate one of our preferred upper cervical practitioners in your area. Just use the search feature to find a doctor near you and schedule a consultation today. This can set you on the path to better overall well-being and may help you to finally break away from jaw pain, and the complications that surround it, for good.